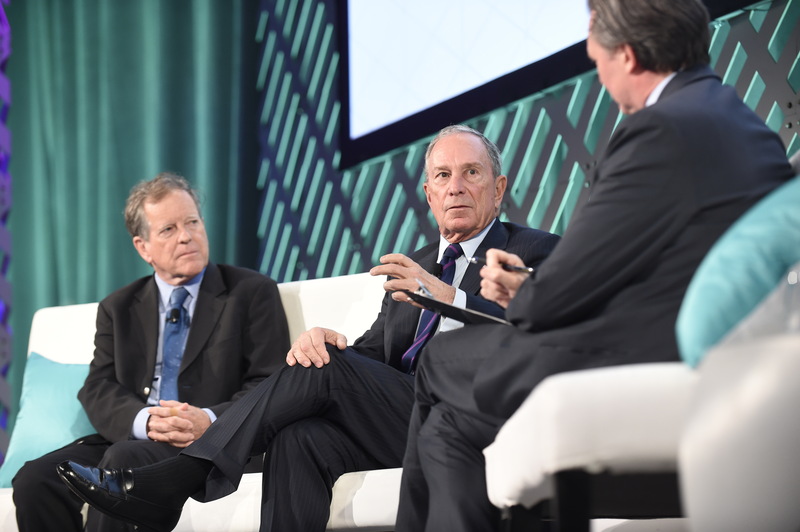 The authors of "Climate of Hope" spoke at the BNEF summit. The conference’s speakers and panels were dynamic and insightful. They generally carried an optimistic message motivated by the adoption of green energy technologies, the shift to cleaner power, and the lowering of energy prices. However, a few also expressed an interest in holding back national and international decisions that are intended to advance clean energy – including the Paris Agreement and the Clean Power Plan. Michael Liebreich, chairman of the advisory board and founder of BNEF, called the developments in the energy sector coming up in the next four to eight years “the age of plenty… on steroids.” His ‘state of the clean energy industry’ presentation contained rich data with national and global examples. “Less-carbon-intensive power is taking over and the transformation is accelerating,” said Paul Browning, president and CEO of Mitsubishi Hitachi Power Systems Americas. The subjects of climate change, the new administration, and the Paris Agreement were discussed throughout the summit. The conference represented diverse outlooks. Myron Ebell, director of the Center for Energy and Environment at the Competitive Enterprise Institute and the lead of the Trump transition team at the United States Environmental Protection Agency (EPA), said that he didn’t believe in climate change largely due to uncertainty in modeling scenarios. This does not square with the other attendees’ seemingly unanimous acknowledgement of the challenges climate change presents. It also does not align with international conclusions reached by the Intergovernmental Panel on Climate Change, which clearly state that the impacts of climate change are not ‘mild’ nationally or globally. Research by the United States Department of Defense and many other organizations supports this viewpoint. Ebell said President Trump consistently made the promise to leave the Paris Agreement during his election campaign. He said President Obama “set a terrible precedent for the future” by having avoided the agreement’s initial ratification by the Senate. In addition, Ebell said he didn’t believe the agreement’s targets could be met under any conditions and efforts to achieve such goals would suppress the growth of the United States economy. He did not cite any research publications that supported either of these conclusions. Secretary of Energy Rick Perry said he didn’t believe President Trump would pull out of the Paris Agreement – although he would want to renegotiate the terms. News since then has shown otherwise, since Trump has announced his intention to make the United States an outlier by departing from the agreement, which had not been ratified by the Senate. However, the departure process will take years to finalize. In a keynote in which he spoke about the challenges and opportunities of his new role, Rick Perry said the government would eliminate any regulations that are not serving the economy well. He announced a 60-day review process to assess whether any of federal clean energy policies have led to premature retirement of baseload power plants over the last couple of years. Michael Liebreich shared a comprehensive domestic and global outlook on the energy space, demonstrating how far the nation has already come in reducing its carbon footprint and decoupling energy consumption from economic growth. He also provided a detailed overview of why and how climate change takes place. Liebreich shared data showing that United States greenhouse gas emissions were down 23 percent in 2016 from 2008 levels. This means the United States’ progress towards Paris emissions targets has surpassed 50 percent. He also noted the decoupling of energy consumption from economic growth with primary energy consumption remained flat as GDP has grown since 2008. Also, United States energy productivity ($ trillion GDP/quadrillion BTU) has improved 13 percent from 2008 to 2016 and is expected to improve further in the years to come. Another important point pertained to increased deployment of renewables and substantial reduction in United States renewable power-purchase agreement (PPA) prices from 2008 to 2016. This included an 83-percent reduction in solar PV and a 71-percent reduction in wind. The image below, which Liebreich shared, illustrated that some of the states with substantial increase of renewable capacity from 2006 to 2016 were Oklahoma, Iowa, Idaho and Kansas. The BNEF team has a bullish outlook on EV market penetration and forecasts 35-47 percent of new cars will be electric vehicles (EVs) by 2040. Just over 1 percent of new cars are EVs today. “Once the sticker price for an electric car is lower than that of a combustion car, we are likely to see a 40+-percent adoption rate within five years,” Liebreich said. He said he saw a precedent in Norway, where over 40 percent of vehicles have plugs today. Five years ago, that number was in the low single digits. The BNEF team expects the sticker price shift in the United States to happen between 2025 and 2030. On day two of the summit, an electric bus company Proterra was named one of the winners of the FiRe Awards presented by Global Innovation Lab for Climate Finance. This achievement will enable the company to scale up its positive environmental impact. Speakers also commented on Tesla’s rapid production ramp-up, Toyota’s plan to phase out its fossil-fuel-powered fleet by 2050, and China’s speedy adoption of car-sharing. This car-sharing plan has had over 400 million sign-ups since its relatively recent inception. Lynn Good, CEO of Duke Energy, and Ben Fowke, CEO of Xcel Energy, said their utilities have embraced transformation. They’ve largely focused their efforts on serving their customers and communities. Also, they have spent a lot of time looking at grid infrastructure, seeking more efficient and cost-effective systems and resources. Related summit conversations mentioned displacing carbon-intensive energy sources, delivering lower-cost electricity, and embracing storage and renewables as the next big step. Kelly Warner, president of Advanced Microgrid Solutions, said storage is becoming a more fundamental part of the model. Technology risk for storage has been declining rapidly as more-evolved revenue models gain traction. The renewable technologies market has seen much interest from large corporations as prices of tax equity have fallen, returns have proven solid, and risk-assessment mechanisms have improved. “Global innovations and state regulations in the energy space have worked,” said Raymond Wood, Bank of America’s managing director and global head of power, utilities and renewables. Concerning infrastructure investment, David Nasom, CEO of GE Energy Financial Services, said that there are many investors seeking to invest in good projects, but certain moving pieces may prevent such investment. Transmission, for instance, requires extensive capital investment. But there are no definitive timelines and assurances for when this infrastructure will actually be built. Focusing on power markets, several speakers stressed that capacity markets are inefficient. This is largely due to the general over-procurement of capacity and lack of innovation. The issue is caused by political risk aversion, regulators’ bias toward incumbents and passion for issuing mandates, and other factors. Describing a power-market model that would work, Liebreich said we could move away from the supply-led capacity markets toward “demand-led flexibility markets.” With these prospects, the structure of power supply will keep evolving with more variable renewables, added storage, and reduced demand.